Given the immense popularity of the Weber Smokey Mountain (WSM) Smoker, Weber has stepped up with this super-sized version. With 726 square inches of cooking area, this unit is perfect for the competition cook or anyone who wants to be able to turn out up to 60 pounds of barbecue. This unit works just as well as its smaller predecessor with the excellent temperature control, long unassisted cooking times and easy use. Added this year to the WSM is a lid mounted thermometer (a must) and a bottom mounted heat shield to protect any surface under the smoker. 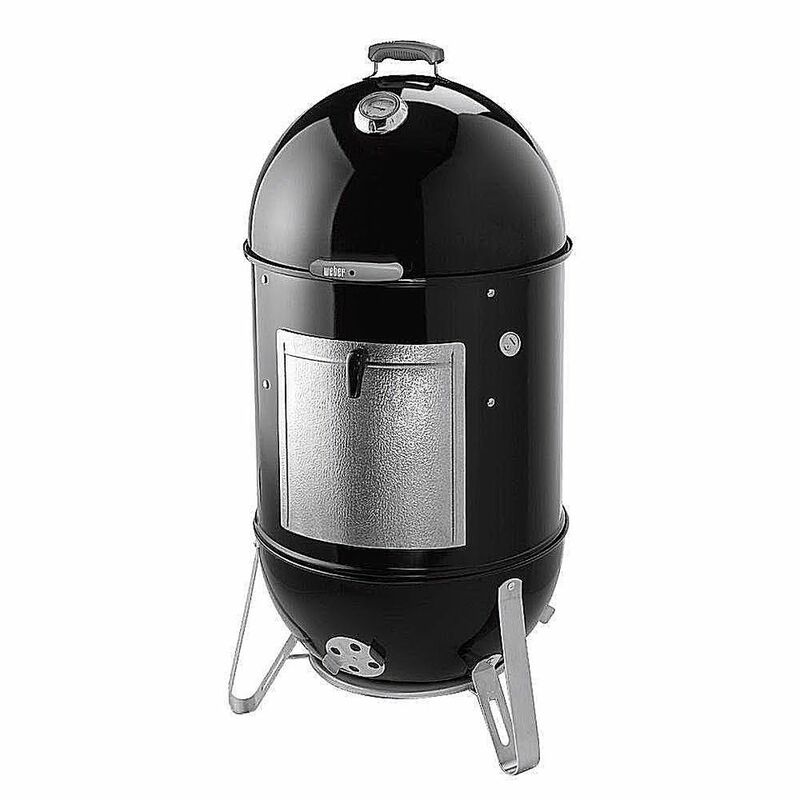 This is a serious smoker that's easy to use. You've probably seen pictures of the incredible smokers that hit this barbecue competition circuit every year. Custom smokers costing tens of thousands of dollars (or more) that are the pride of serious barbecue cooks. Well for every one of these on the road there are probably a dozen Weber Smokey Mountains (WSMs). These easy to use smokers produce fantastic barbecue, hold temperatures for very long periods of time cost a whole lot less (list price is $499 but can be found for $399). With this kind of popularity, Weber has finally come up with a larger version of this smoker. With 726 square inches of cooking space divided between two cooking surfaces, the 22.5 inch Smokey Mountain is perfect for the person who wants to produce a lot of barbecue. What is particularly good about this size is that it more easily holds whole racks of spare ribs in addition to giving you enough space for 60 pounds of pork butts or perhaps 4 large turkeys. Added to the WSM with this model is a lid mounted thermometer which is a necessary addition. Previously people had been drilling holes in this smoker to put in a thermometer so they could determine the cooking temperature without having to open the lid. The large thermometer mounted in this unit is accurate and divided at the 5-degree mark giving it a high level of accuracy. Also added is a bottom heat shield to help protect any surface that the smoker is put on. This heat shield also seems to have the effect of reflecting heat upwards making the smoker more efficient.